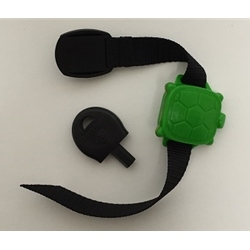 Add additional child turtle wristbands to the New Safety Turtle 2.0 Child Immersion Pool/Water Alarm Kit or the New Safety Turtle 2.0 Pet Immersion Pool/Water Alarm Kit. A Safety Turtle base can accommodate as many wristbands as needed. Have extras for guests or other children in the house. Each wristband comes with a key to secure it on the child’s wrist. Works in salt water pools. Unlimited pet and child bands can be added to one base. Works in Salt water pools . Portable - Take to friends, beach, vacation, etc. Cute design makes kids want to wear!